As we approach April's Patch Tuesday updates (ok, they've been a day or two late in recent times, but...! ), it's worth noting that this one will be the last ever patch for 'Windows 10 Mobile Anniversary Update'. Which is massive in theory, but it won't impact too many real world users, especially those clued up phone users who read AAWP, as I explain below. UPDATE: Six months extension for 'phones' has been applied now and the last OS patch for Anniversary Update will be in October 2018 after all. Still, this story raises some urgency about ways to take older devices forward, so....! As always, we emphasize the importance of installing the latest Windows updates when prompted on your device, so you are on the most secure version of Windows 10, which is version 1709 (Fall Creators Update). As a reminder, Windows 10 version 1607 (Anniversary Update) will reach end of service and receive its final security update on April 10, 2018. If you see a reminder that the latest version is ready to install, we recommend you follow the steps to pick a time that works best for you or update immediately... Servicing timelines for each version of Windows 10 are shared on the Windows Lifecycle Fact Sheet. 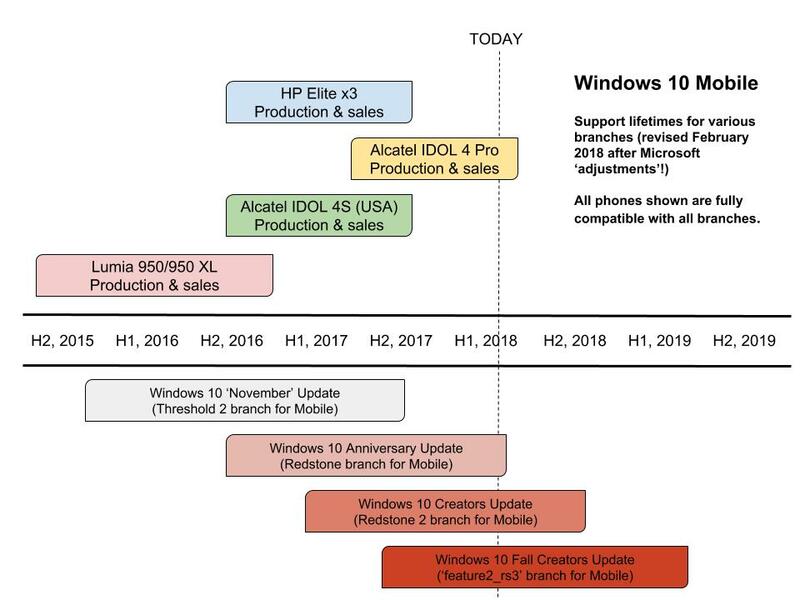 For the desktop (so laptops, Surface hybrids, and similar), the end of support for Windows 10 Mobile Anniversary Update (AU) is irrelevant, since every single piece of hardware will have been upgraded over the air by now, to Creators Update (CU) and Fall Creators Update (FCU) - it's just part of the regular Windows As A Service (WAAS) that was introduced when Windows 10 was introduced. I have several really old laptops (one started life under Vista!) that run Windows 10 just fine and are bang up to date. Things are more critical in the phone/mobile world, with the limitations of phone hardware making it more important to set support limits on the hardware - after all, the mobile world changes so fast. We still get many years out of a phone, but less so than for a traditional (e.g.) laptop. So, for example, we had the first generation of Windows Phone 8 phones (think Lumia 920/925, 1020) 'max out' at Windows Phone 8.1 officially, plus some of the lower end x30 Lumias, while everything from the Lumia 735 upwards started on Windows Phone 8.1 but is still (even today) officially updatable to Windows 10 Mobile through the Upgrade Advisor utility (still in the Store). But here's where things get a little thorny, in the light of the imminent AU deadline. The Lumia 635 (1GB RAM), 735, 830, 930, 1520 and Icon, all very popular and common devices, were officially deemed by Microsoft to end their days on Windows 10 Mobile Anniversary Update. Fair enough, when you think that some of these phones would then be five years old and struggling in many areas, but some of these much loved devices are in the hands of AAWP readers and you (and I) want them to keep going, with full support, for even longer - after all Windows 10 Mobile still flies on the Lumia 930/Icon and 1520 in particular, with their 2GB RAM quotient. Now, last year - 2017 - things were simple. All you had to do was hop into the Insiders programme and bang, these older phones would be on CU at the very least, giving another six months of support patches and updates (taking them to Autumn 2018). But then Microsoft wound down the Insiders programme for 'Mobile' at the start of 2018, meaning that there's a very real possibility that the uninitiated might be left high and dry (relatively speaking) on AU in 2018 and, after next Tuesday, at the risk of exploits and vulnerabilities*. * Of course, Windows 10 is pretty secure, W10M even more so, plus W10M is such a small target relative to Android and iOS that security isn't as huge a deal as it might be for other older smartphones. But you're not uninitiated - you read AAWP and so you know that there (ahem) ways to get all of these classic Lumias on FCU and so gain a full extra year of life and (semi-official) OS support. In short, you sideload Interop Tools and then hack the registry to make the old phone pretend to be a Lumia 950 XL and thus get all the newer official upgrades. And, once on FCU, you can revert the registry to its original device naming/type (if you wish). 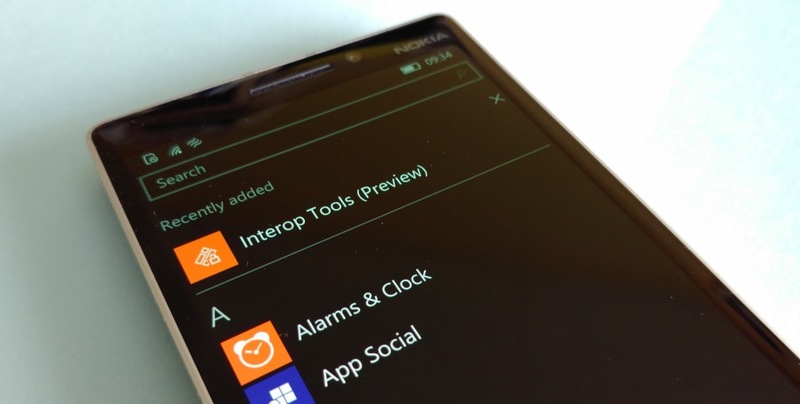 This procedure sounds scary, and it's totally unofficial and unsupported, but I've done a full Interop Tools 'faking it' tutorial for the Lumia 830/930's generation and tested it with several phones, so I know it works. Just follow along if you have a few spare hours, a Windows 7 (or above) PC, and know what you're doing in terms of files and folders. I'll link back to all this next week as part of the monthly OS updates with, as I say, the last ever patch for AU.